(Phys.org) -- Label free optical biosensors enable the monitoring of biomolecules and their interactions in often highly sensitive diagnostic assays. Several methods have been employed for this purpose, including Whispering Gallery Mode (WGM) biosensing, which offers a particularly sensitive approach to quantify the mass loading of biomolecules on the resonator surface with ultimate sensitivity estimated on the single molecule level. 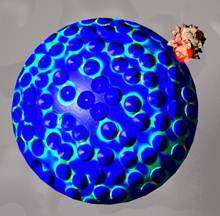 The simplest WGM biosensor is a glass microsphere (typically 50–100 mm in diameter) where the resonant light remains confined by total-internal reflection.